Sourdough batter bread is a super easy way to use your sourdough starter, even discarded starter works in this batter bread – and adding cheese to it makes it ten times better! A batter bread (a yeast bread that doesn’t require kneading or shaping) is a super simple way to make yeast and sourdough breads, making it a great way to start your bread-making journey. Plus it’s a perfect way to make a loaf of bread with a young sourdough starter that maybe isn’t strong enough to raise a traditional loaf. My family loves this cheesy sourdough batter bread – so much so that my kids started requesting it after the very first time I made it, so I’m sure your family will, too. You can make it as cheesy as you want (of course here, we’re firmly on the side of more…) and since it’s a batter bread there’s no kneading or shaping. And I love that it’s another winning recipe that uses up my sourdough starter along with our favorite waffles, English muffins, and crackers. Why the obsession interest in sourdough? I don’t know. 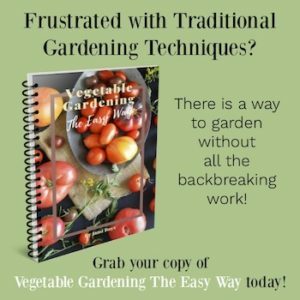 I think it’s kind of like growing vegetables from seed – it’s that “I did it all by myself!” thing. 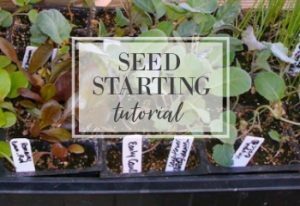 Growing my own starter and keeping it alive seems very similar to growing seeds and keeping them alive until harvest, don’t you think? I keep my starter in the refrigerator and feed it the night before I want to bake with it to get it nice and active for the morning. I’m sure you’ll want to read more tips for using sourdough and my easy guide to all things sourdough because you’re going to want to try this easy bread! My biggest tip is always: remember with sourdough, time is key, so start early and let the dough rise fully. I adapted this recipe from one I found in Discovering Sourdough Part 1, a wonderful ebook by Teresa Greenway that I recommend if you’re wanting more recipes using your starter. 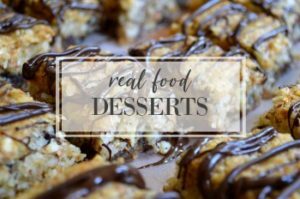 Note: the following is a pictorial tutorial, click on the arrows at the top or bottom page to go to the full printable recipe. 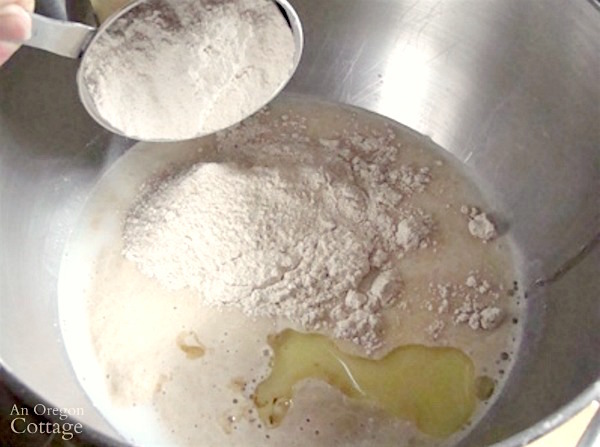 In the morning of the day you will bake the bread, add all of the ingredients to the bowl of a large mixer and stir on medium speed for 2 minutes, until thoroughly mixed, before kneading for another 5 minutes with a dough hook. Tools used: This is the Kitchenaid stand mixer I use for all my bread making and these are the metal measuring cups and spoons I prefer (SO much better than plastic!). Now just cover and let it sit in the mixing bowl for about 4 hours until doubled in volume. I was serious about the “incredibly simple” part, huh? Tools used: I like to cover bread doughs, leftovers, and potluck food with these reusable “shower cap” covers (no, they’re not really shower caps, but they look like it). I’ve seen thinner caps sold at The Dollar Tree and similar sturdier ones here on Amazon. I love being able to reuse them and they stay on flat plates much better than plastic. I’ve found that they keep in the moisture better than just a cloth towel for covering bread dough, too, so it never develops a hard top when rising. 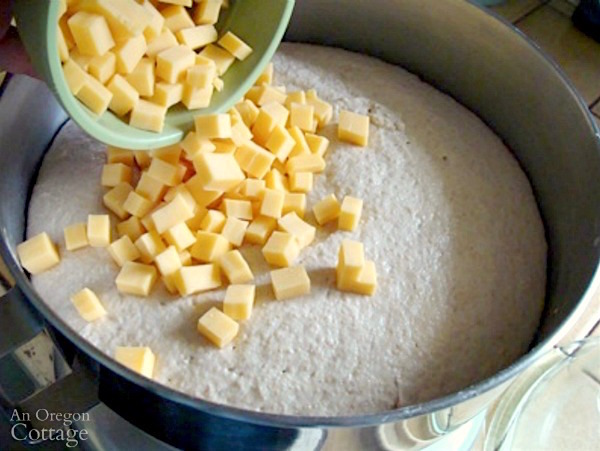 When the dough has doubled, add 1-2 cups of diced cheddar cheese and stir on low until the pieces are distributed throughout the dough. I strongly suggest sharp cheddar or other sharp, strong cheese like parmesan. It gives the most bang for your buck. It’s cheesier with 2 cups, but you’ll need to bake the loaves with a cookie sheet under the pans, because the cheese will ooze over the sides. No oozing with 1 cup, but less cheesy…your choice. 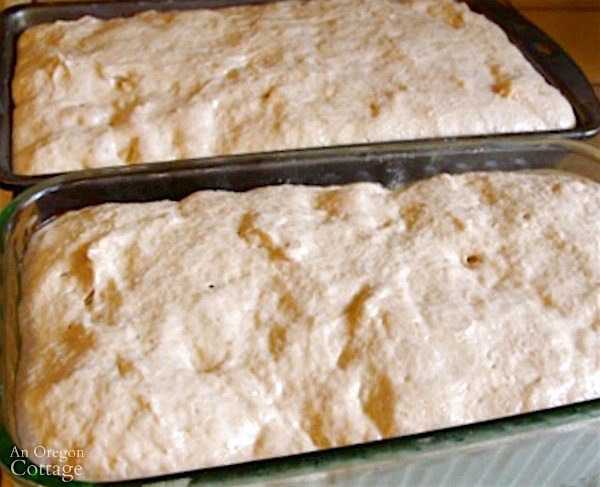 Divide the dough evenly between two greased 9″x 5″ loaf pans (they should fill about halfway). TIP: make sure all the cheese pieces on top are covered by a bit of dough to lessen the amount that will ooze out in the oven. 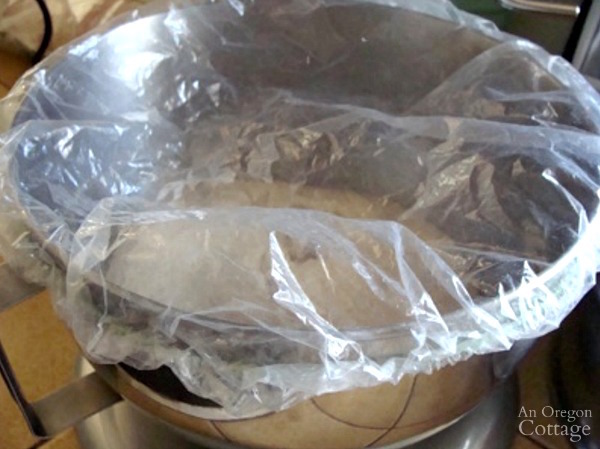 Cover with oiled plastic (I use my reusable covers again) and let rise for another 2 hours or so (the temperature of your kitchen may affect rise time). When the dough is at the top of the pans, heat the oven to 400 degrees and brush the tops of the loaves with oil (this helps the loaves brown evenly). Bake for 35 to 40 minutes, turning loaves as needed for even cooking, until nice and browned. Let cool in the pans for a few minutes before turning out onto a cooling rack. 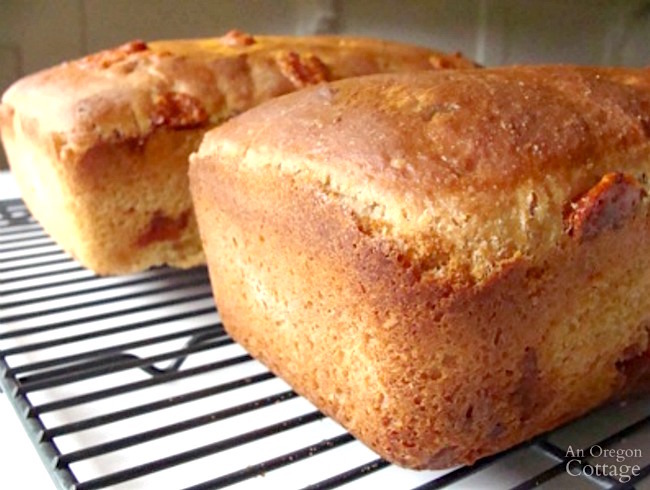 TIP: can you see the difference between the loaves baked in metal pan vs. a glass pan? The dark metal pan browned the loaf much more evenly and created a nice crust. Lesson learned: metal loaf pans work best with this recipe. 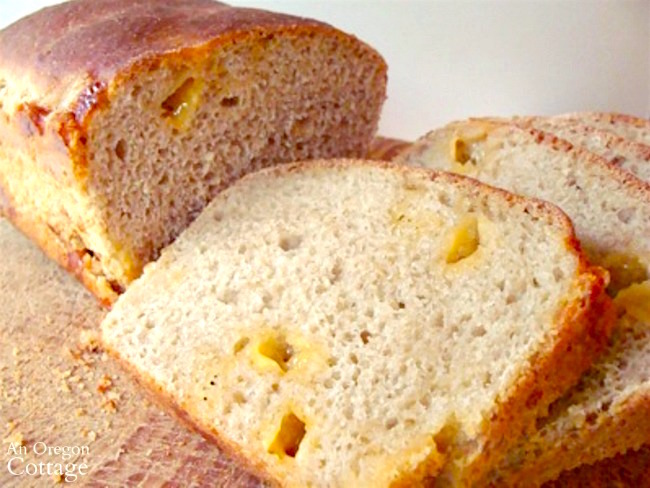 You’ll want to serve this bread warm- it’s cheesy heaven. And toasted? Then it’s perfect with homemade tomato soup or simple, family pleasing chef’s salads, depending on the season. 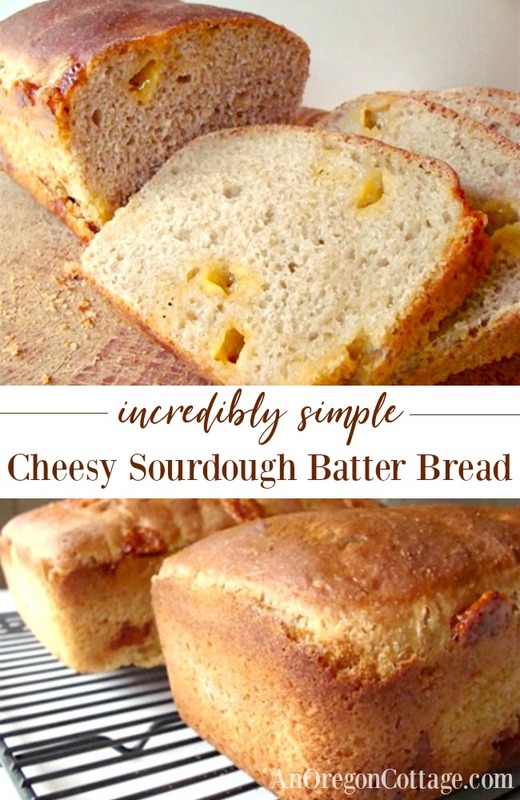 Click the arrow for the full Cheesy Sourdough Batter Bread recipe (with print options)! 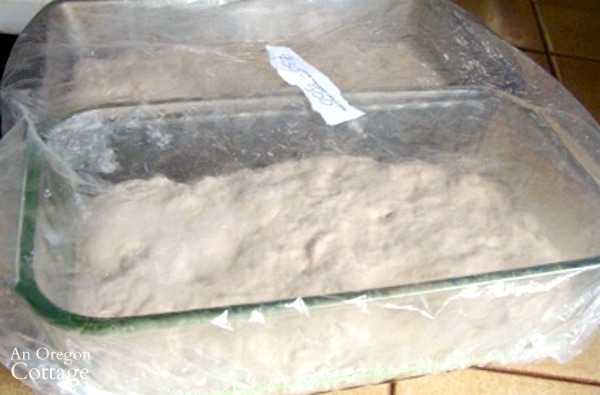 the preheated oven the bread is suppose to continue rising. the bread not rising after it was put in the oven. Thanks for any help on this that you can give me. Yes, batter bread typically just goes to the top of the pan in my experience, so I guess it doesn’t rise after being in the oven. Hope you enjoyed the bread – we love it’s cheesy pockets! Goodness, that sounds wonderful – I’ll have to try that, Helen! I was really surprised at how good the combination of fennel seeds, lemon & currants came out. I was thinking possibly that it would be a flop as I more or less just threw the ingredients together hoping I would remember the recipe after, which I did. I enjoy experimenting with different flavor combinations in bread. This bread has a slightly sweet taste from the currants & honey, with bursts of tangy lemon & subtle licorice from the fennel seeds. Next time when I make this bread again, I may toast the fennel seeds in the oven at 250 for 10 minutes as this is suppose to bring out their aromatic oils. Also would like to experiment with reducing the white flour to more whole wheat flour. I am hoping to try a ratio of 1/3 cup white flour to 2 cup whole wheat flour. Don’t know if this will work for sourdough batter type bread or not? When I make my regular kneaded sourdough bread, I use only 1/2 cup of white flour to 3 cups whole wheat flour per loaf & it comes out wonderful. If you are still interested Jami, here are the ingredients to make 1 loaf. 3 tbsp vital wheat gluten (this may be optional)? 1 tsp ground coriander (probably could use more)? I know for myself that I will be making this again as I absolutely love it. Hope you will give it a try Jami.